Come visit the charming city of Victoria, British Columbia’s capital city. Multiple winner of Conde Nast Magazine’s “ Best City in the Americas” award and home to some truly incredible courses Victoria is a superb choice for any golf vacation. On Victoria’s courses you can tee off on holes that jut out into Pacific waters, hit approaches to greens defended by water falls or drain putts on greens that offer a 180 degree panoramic view of the city skyline and the snow capped Olympic Mountains. 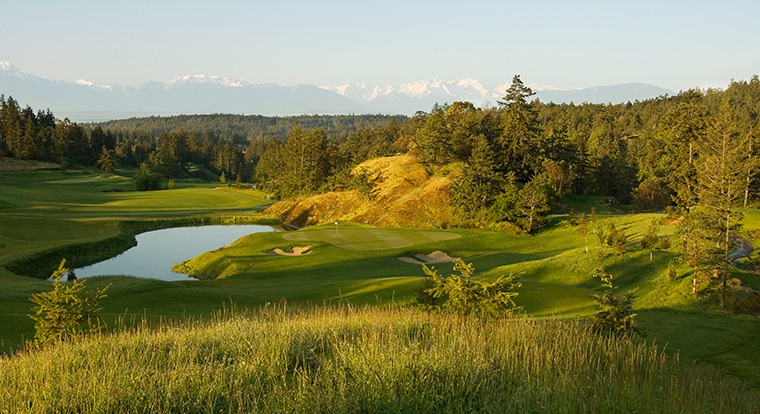 From the venerable Victoria Golf Club, one of Western North America’s oldest courses, to the modern Bear Mountain, Jack Nicklaus’ latest mountain golfing masterpiece, Victoria has the golf experience you are looking for. Your time off the course is filled with seemingly endless possibilities: Tour the world famous Butchart Gardens, browse the shops on Government Street, go whale watching in the protected waters of the Gulf Islands, indulge in a traditional High Tea at the Fairmont Empress, visit the incredible Provincial Museum of Natural History, dine on the deck at an outdoor café, or while the night away at any one of Victoria’s fantastic pubs or nightclubs. With three unique golf rounds and two nights of accommodation you will have lots to do on and off the golf course. Prices are per person based on double occupancy and subject to applicable taxes. Prices based on golf M-Th. Weekend travel may be subject to $13 – $17 rate difference depending on season and order courses are played in.